Arthur Less has been here for three days; he is in New York to interview famous science fiction author H.H.H. Mandern onstage to celebrate the launch of of H. H. H. Mandern’s new novel; in it, he revives his wildly popular Holmesian robot, Peabody. In the world of books, this is front-page news, and a great deal of money is jangling behind the scenes. Money in the voice that called Less out of the blue and asked if he was familiar with the work of H.H.H. Mandern, and if he might be available for an interview. Money in the messages from the publicist instructing Less what questions were absolutely off the table for H.H.H. Mandern (his wife, his daughter, his poorly reviewed poetry collection). Money in the choice of venue, the advertisements plastered all over the Village. Money in the inflatable Peabody battling the wind outside the theater. Money even in the hotel Arthur has been placed in, where he was shown a pile of “complimentary” apples he can feel free to take anytime, day or night, you’re welcome. In a world where most people read one book and that this night will be the glorious kickoff. And they are depending on Arthur Less. 2018 Pulitzer-prize winning novel Less by Andrew Sean Greer. It is a comedic book about Arthur Less, a white male gay writer, about to hit fifty, who to avoid attending the wedding of his ex-lover decides to accept all the “literary” invitations in his inbox to attend around the world. 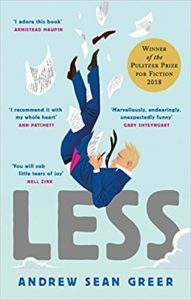 A surprising win at this year’s Pulitzer award, Less is a delightful novel for its romp through the literary space around the world, attending book launches, panel discussions, literary festivals, workshop retreats, creative writing classes etc. Wait for the superb end! Andrew Sean Greer was in Italy when he heard he had won the Pulitzer Prize. To confirm the win he called his friend, novelist and former winner of the Pulitzer Prize, Michael Chabon. This is what he posted on Twitter. It’s been a tough year, and a tough time in the world. And perhaps it is foolish to believe, but I do believe, despite all this, in the possibility of joy. In this wonderful interview with Isaac Fitzgerald on AM to DM, Buzzfeed News, Andrew Sean Greer discuss writing of this comedic novel which also happens to set a new benchmark for gay art/queer narratives. Greer says that at first Less was a sad and serious book but taking pity on the character he rewrote it. He admits that events and places the character visits are “totally pilfered from my life, in a kleptomaniac way”. Less is going to be a book that will be exceedingly difficult to forget. It will stick for years to come. There is something about it that is impossible to shed. It is there forever.